When the end of the world comes in 11 months, we’re going to be so prepared. In a complete reversal from New Years’ Eves past, where we’ve raced against the clock to mix drinks for the hourly toast to the new year in each time zone and scoop hot food into serving dishes—I was roasting chickens three hours before midnight last year—our party-throwing foursome was eerily on the ball with our deadlines this time around. Bryan stirred up big pitchers for each sipping shot ahead of time (a new roster this year, with Sazeracs, Painkillers, and vampire-inspired Romanian “blood” drinks among the choices), while LeeMichael finished all the painting touch-ups before we pulled into the driveway—since every apartment or house the guys have lived in has been in a constant state of renovation, this is no small deal. Dan even tied on an apron to trim green beans and stir batter while keeping one eye on the college bowl scores. After powering through my usual midmorning panic, by 5:30 p.m. I was not only done cooking, but also showered, dressed, and bedecked in green and blue faux eyelashes that shimmered like tiny peacock plumes on each lid. Only thing left to do was pour a nice plastic cup of red wine and kick back in the club room to chat with the crowd. Sitting, drinking, and chatting? Not sweating, swearing, and shoving casserole dishes in and out of the oven? How did I pull off this kind of New Year’s party? I have a hunch it was partially due to our choice of food theme. 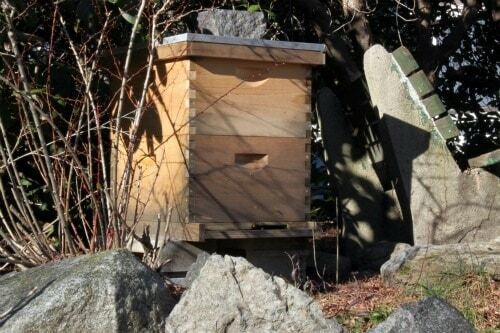 Departing from our International Cuisine Spotlight Series for the second year in a row, we decided on honey as this year’s culinary focus in honor of Bryan and LeeMichael’s latest tenants: 40,000 bees in a cozy little backyard hive. After last year’s success in converting new kale fans, I upped the ante with a dish featuring another oft-maligned and dismissed vegetable: Brussels sprouts. Crisping up the mini cabbages in a hot oven, I brought out their natural sweetness, pairing the caramelized orbs with a sweet and salty dressing punched up with honey, mint, and just a little more minced chili pepper. In my informal quiz for favorite dish of the night, the Brussels sprouts fought a good fight with the pulled pork to emerge as the winner. I’ll feature more of the original recipes in the menu below throughout the year on Good. Food. Stories. 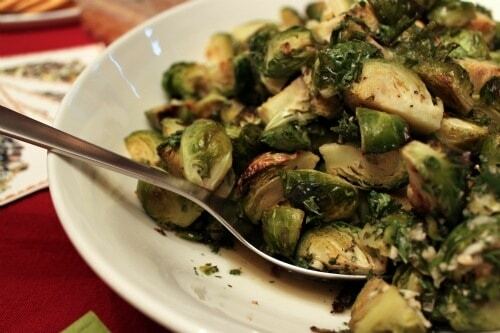 ; meanwhile, why don’t you resolve to give Brussels sprouts a try with the recipe below? After all, if the Mayans are right, this might be your last chance to learn to love them. Preheat the oven to 450 degrees F and line two rimmed baking sheets with parchment paper. Rinse and trim the Brussels sprouts, cutting each sprout into quarters. Toss with the olive oil and sprinkle with salt. Spread the Brussels sprouts evenly across the two baking sheets and roast for 20 minutes, until darkly caramelized spots are appearing on the vegetables and the loose leaves are crispy. While the Brussels sprouts roast, whisk the remaining ingredients together. Transfer the cooked Brussels sprouts to a serving dish and toss with the dressing. Serve warm or at room temperature.